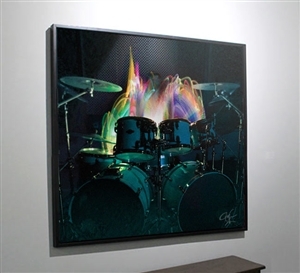 The fine art debut collection of Gene Hoglan has been underway for more than a year. 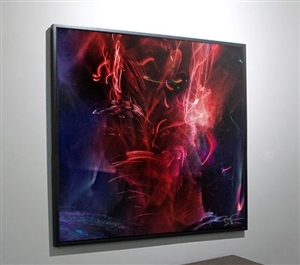 Working with drumsticks that light, much like a painter would use oils, Hoglan constructed the visuals in the collection through an extensive process with the objective of showcasing his individual rhythmic style onto canvas. Working with art team SceneFour in Los Angeles, the process of creation begins with open shutter photography, allowing Hoglan to build the visuals through short incriments of drum performance. 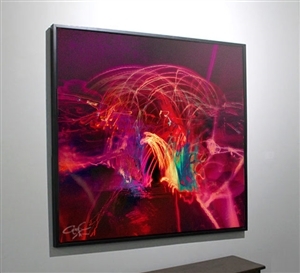 The result is a collection that aesthetically embodies the drummer's rhythmic approach within 12 unique pieces of art. All pieces within the collection are available in highly limited editions, with each work numbered and individually signed by Gene Hoglan.